9 Coolest Kids That Will Definitely Inspire You! By Singyin Lee in People. Updated on February 29, 2016 . Kids always amaze me with their brutally honest opinions, their no-nonsense approach to what’s black or white with little to no care for what falls under the shade of grey, as well as their unflinching need to see justice done, where and when it is most needed. These days, kids not only ask the questions adults don’t dare to ask or think about asking, they also get their hands dirty, getting help to where it is most needed. If you have ever felt powerless against society’s concepts of “this is how things work”, let what these kids did remind you of what you can do if your heart is in the right place. These kids do their bit to help the homeless, cancer patients, hospitals and victims of natural disasters – and the most amazing thing is that the oldest kid in this list is only 12. 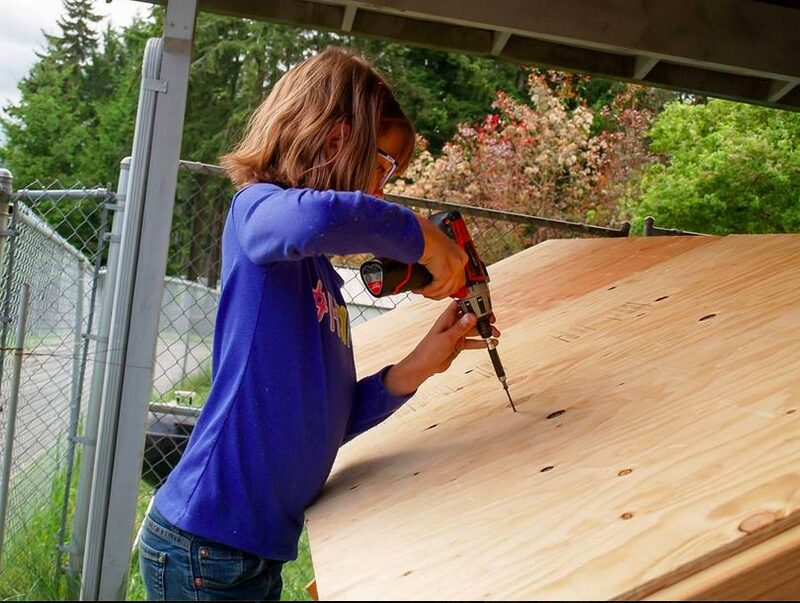 Hailey Fort is no regular 9-year-old – you just need to look at how she handles herself around power tools to know that. Having befriended Edward, a homeless guy, Hailey felt that he should get a roof over his head. That’s why she built him (yes, she actually built it with her own hands) a mobile shelter, an 8 by 4 feet “house” complete with windows and insulation to keep out the cold. Hailey is no stranger to helping out the homeless. Before the house-building, Hailey also tended a garden, the produce of which was donated to the local food bank to help feed the homeless. In 2014, her garden produced 128 lbs of food. You can follow Hailey’s efforts and more at her Facebook page, Hailey’s Harvest. Kids get bullied in school all the time for the pettiest of reasons. Christian McPhilamy was also bullied in school, for growing out his blond hair for two years, but he stuck with it because he was doing it for a good cause. 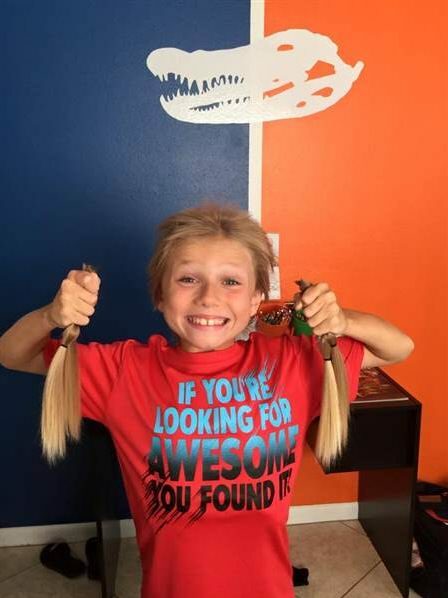 After seeing a commercial about paediatric cancer and later on stumbling upon a hair donation ad, Christian, who was 6 at the time, decided that he wants to donate his hair for the sick children. In the two years he spent growing his lovely blond hair, he endured teasing and bullying in school, and comments about what a “lovely daughter” his mother has. He ha sjust recently cut off his hair: 4 ponytails, close to 12 inches long, to donate to the Children with Hair Loss organization, a charity which provides free wigs for for children who suffer from cancer, burns, alopecia or other conditions. Eight-year-old Gracey Chafin had also donated 10 inches of her hair to a classmate who had leukemia but she was bent to keep on giving. At a shopping trip to the mall with her grandmother, she learned about the Children’s Hospital through a donation drive. 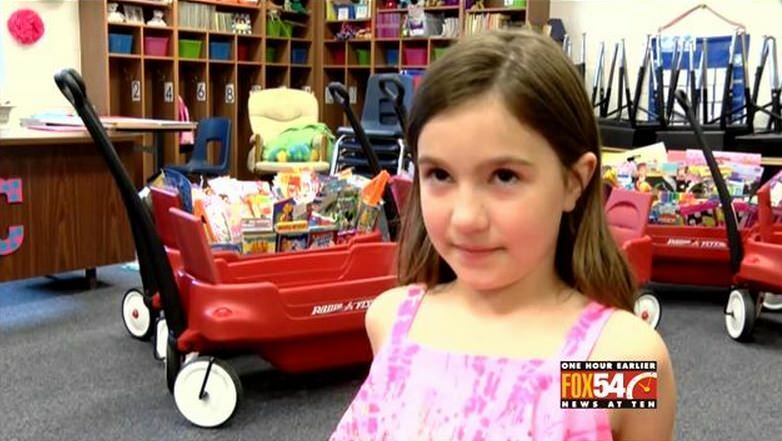 That gave her the motivation to start a fundraiser at her own school (never mind that she was just 7) where she collected 1300 items, including toys, books and games, to give to the children’s hospital. This year, she did it again, and collected 2000 items. Her next goal is to breach 3000 items in the next fundraiser. Her gifts are used in the hospital to comfort and reward child patients who sometimes have to go through taxing and painful treatments and life-saving surgery. Every Friday, 12-year-old Robby Eimers and his grandmother, Cindy Kostukoff, will gather clothing, toiletries, water, and food to give away. 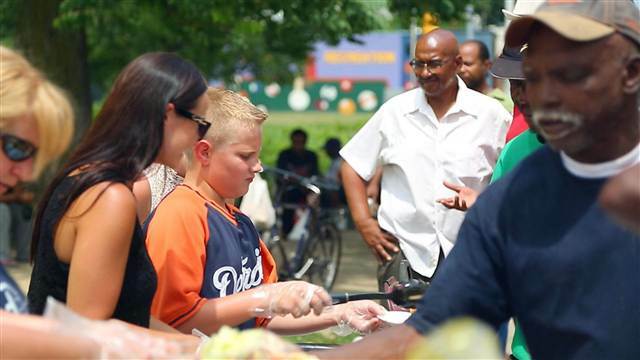 Together with 8-year-old Emma, Robby’s sister, they then make their way from New Haven to Detroit, Michigan to set up tables and serve food to the homeless. Robby used to wash cars to pay for the items but his cause now gets the support and some donations from Wal-Mart, the Detroit Red Wings and kind samaritans. The boy not only has a big heart, but big dreams too. He wants to be President one day and vows to get homeless people off the streets. Robby and his grandmother has since started the Eimers Foundation. You can visit the Eimers Foundation Facebook page to follow his activities or if you are looking for ways to help. 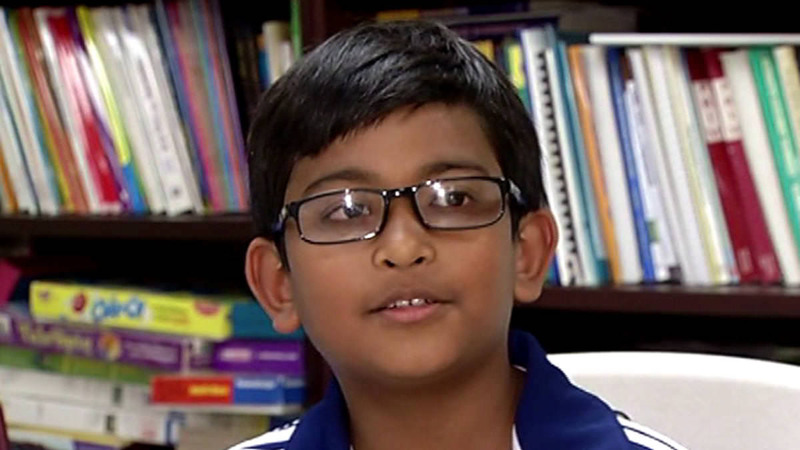 Neev Saraf might be at an age where you don’t expect him to know the value of a dollar but that doesn’t stop him from being a serial philanthropist. Every time he turns a year older, he donates to charities; he had previously donated to Toys for Tots and the Salvation Army. This year however, he decied to do more for a different group: the victims of the Nepal earthquake. Neev started a drive by throwing in his piggy bank savings, all $384 of it. His parents, both from Nepal, helped him spread the word on social media and before long, Neev’s crowdfunding efforts helped raise more than $27,000 in just 10 days. The donation was forwarded to American Nepal Medical Foundation to assist in rescue and recovery work in Nepal. Xavier Elliot is 10, and on a mission. 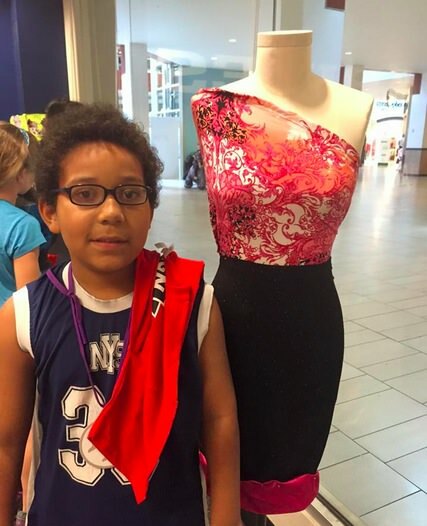 After moving through 6 different homeless shelters, Xavier felt that he could do more for homeless children, so he decided to make clothes for them. He picked up some sewing skills from his mom and bought his own fabric with his allowance then just got down to making clothes. And he’s pretty good too. His mother, a veteran advocate, has been very supportive of her child’s work and has set up a Facebook page to share Xavier’s work and campaign. Donations have been pouring in to help with sewing and fabric supplies. Noah Hall King was only turning 5 when he raised $1200 for his local fire department; and on his 6th birthday, he raised $1,800 for the local police department. For his 7th birthday, he went door to door, and even started a website to ask for donations for the Neonatal ICU at the Winnie Palmer Hospital for Women and Babies. 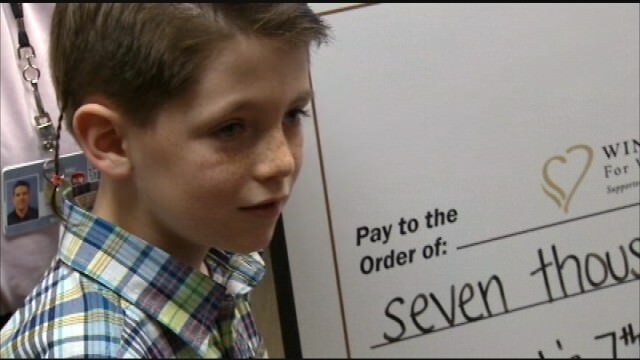 All his efforts paid off when he raised $7000, all of which he gave to the hospital. The hospital has decided to use that donation to buy a piece of equipment for breathing support that will help their little patients. So what’s next for his 8th birthday? You guessed it. He’s going to help the homeless. Seeing someone stop his car, get down and give his own coat to a total stranger on the street, made Nate Dreyfus feel like doing the same thing. And he isn’t going to let his tender age of 9 stop him. 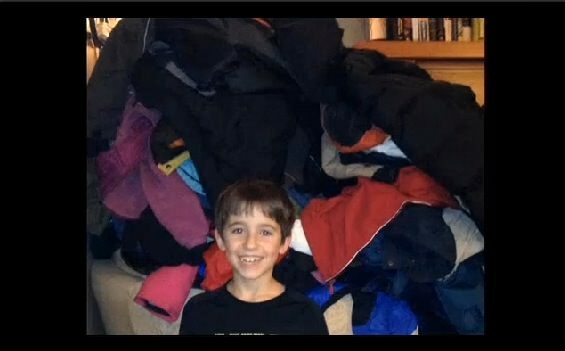 Nate started putting donation boxes in his neighborhood and with his mom’s help, spread the word, asking for coats that are no longer needed or used, to donate to the needy. The drive worked, and the Director of Project Home, a homeless shelter for families received 79 coats and a $262 donation in time for the holidays. Nate has since returned to Project Home with more coat donations. Sometimes a small act of kindness is all it takes. Our pint-sized hero for this story is Josiah Duncan, who one day saw a homeless man outside a restaurant, and began asking his mom questions. Troubled to find that the man had no food, among other things, he urged his mother to buy him a meal. 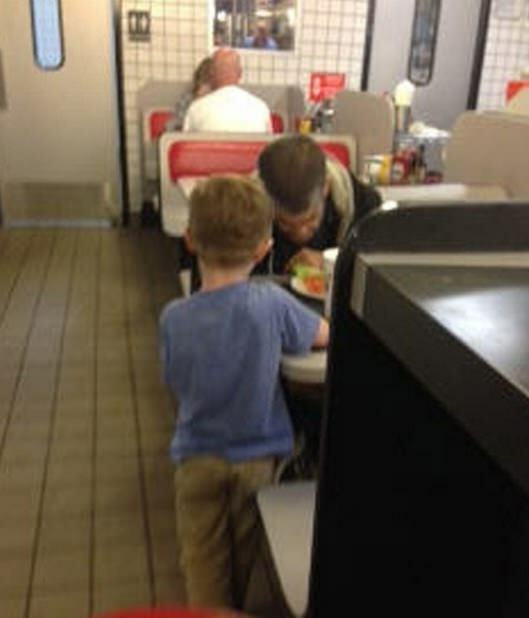 His mother, Ava Faulk, obliged and asked the man to come in, sit down and order anything from the menu. Josiah even asked the man if he wanted a menu because “you can’t order without one” when no one waited on him. Right before eating, Josiah asked the man to join him in saying the blessing (which he sung at the top of his voice) and leaving everyone at the restaurant in tears. There are so many more kids out there doing things you would probably expect the grownups to be doing, it is impossible to name them all. From collecting food, shoes, blankets and other items to donate to the homeless, to forgoing toys and birthday gifts to give to another less fortunate child, these kids are showing the adults that you are never too young to give back.